The Halifax Centre of the RASC is an active association of over 200 amateur and professional astronomers, united by their appreciation of the night sky and the wonders it contains. The Centre is located in the provincial capital city of Halifax, Nova Scotia, Canada, but many members live in several outlying communities, other provinces, and even other countries. 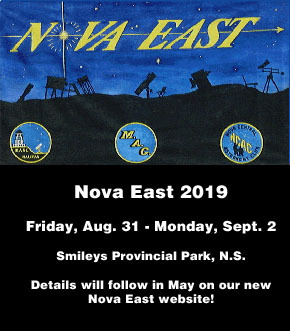 The roots of the Centre date back to 1951 when, with the help of Father Burke-Gaffney of St. Mary's University, the Nova Scotia Astronomical Society was founded. The NSAS became the Halifax Centre of the RASC in January 1955. 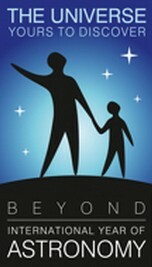 The RASC prides itself in educating the general public about astronomy. The public programs sponsored by Halifax Centre include: lectures, public star nights, and activities during special astronomical events. All photos and drawings on this site were created by RASC Halifax members, who reserve all rights. Monthly RASC meetings open to everyone! The Halifax Centre will be holding its usual monthly meeting on Saturday, May 4. NOTE: The meetings of the Centre will be on the FIRST SATURDAY of the month in the AFTERNOON. We hope this will allow more people to participate. Special Guest: Jenna Hinds, RASC Youth Coordinator. -This month's instalment of the Observer's Handbook overview is Part 2 of John Read's moon presentation -Women with Impact (craters named after women)! As always, treats and beverages will be provided for a break midway through the afternoon. Following the meeting, members will be invited to go out for dinner. Paul will ask at the end of the meeting as to who is interested in going out for dinner and further socializing. Hope you will enjoy this new format on the Saturday afternoon. Looking forward to seeing one and all at the meeting. The fall schedule will be posted over the summer once the dates are confirmed. Check out our Observing Aids, including the Clear Sky Clock, a sky map, and observing lists. Visit our new Responsible Lighting page. Find out more about The Halifax Centre. Updated 2016 Oct 13 by the Webmaster.